﻿﻿The holidays are gone and so are most of the decorations except…your door wreath. If you are about ready to dispose of your falling needle wreath; don’t. 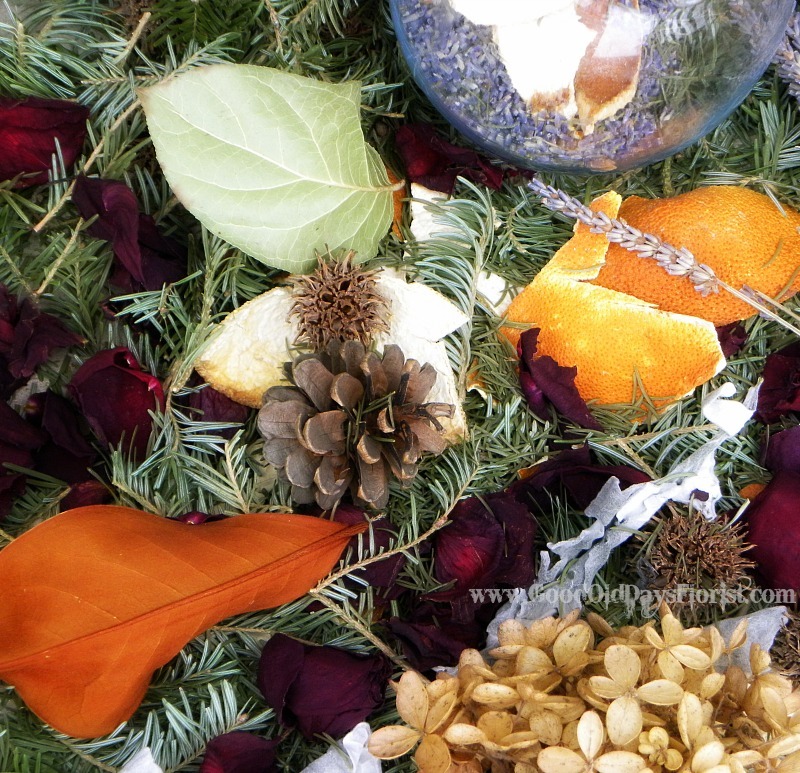 Instead, honor the branches the tree so graciously gave by creating a lovely sachet of ‘wreathpourri’. Natural winter aromatherapy is always the easiest to create as usually everything you need is free and on site; with contributions from a short morning walk. From the 17th century on, potpourri has been crafted only from forest, garden, and kitchen ingredients of the season and on hand. There was no store to buy premade packages from China and surely no dyed pods and plastic scent chips however there is no comparison to a freshly made bowl. *Evergreen wreath and/or branches/centerpiece leftovers. Next, enjoy your flowers, eat your oranges and squeeze your lemons/limes but save the petals and slice the skins into 1-2” pieces then add all to your box to dry. And lastly, talk a winter walk. You don’t need to go far, just take in the scenery and look; look around the ground that is. Pine cones, sweetgum pods, rosehips, bark, acorns the squirrels missed; keep looking. The rule of Mother Nature is if you take something-leave something so toss a copper penny if you pick anything….ground items are gifts so they are free. Check your box every few days to test a branch. If you can run your fingers down a stem to remove the needles and the citrus peels are hard then you are ready to make your sachet. Over your box, shred the stems and cut them into 2-4” pieces (the stems also hold the aromatic oils). 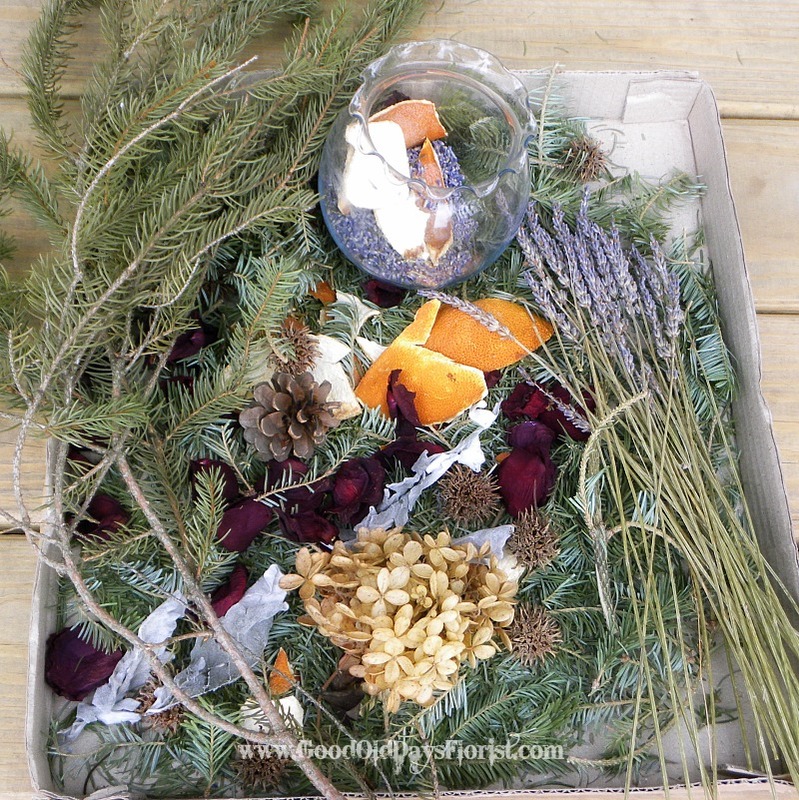 Add your outdoor finds, dried flowers and mix while crumbling some needles. I also like to add bits of dried lavender but if you like a spicier blend you can add a cinnamon stick or a few cloves. Pack handfuls into your jars or bags. A small sachet in your pillow will enhance your sleep. Enjoy.